In December of 1934 New York Central class J1E Hudson 5344 was shrouded and became the first streamlined steam locomotive in North America. The following year the Milwaukee Road's 4-4-2 Hiawathas became the first steam locomotives that were built streamlined from the builder. For the next 15 years many more colorful and uniquely designed streamlined steam locomotives were built. As it turned out, streamlining had little effect on the aerodynamics of the locomotive except at the highest speeds. The real purpose was simply to improve the locomotive's appearance, particularly for passenger service. Unfortunately, streamlining created a problem. Any part of the locomotive that was covered with sheet metal for the sake of appearance less accessible for maintenance. As a result, streamlined steam locomotives would often leave the shop a little less streamlined than when they arrived. Also, a number streamlined locomotives lost their shrouds in wartime scrap drives. In 1947 the black, gray, and cobalt blue Nashville, Chattanooga & St. Louis Railway's six car heavyweight City of Memphis became the last train intended to be pulled by a streamlined steam locomotive -- the Class K-2D 535. In 1950 the last streamlined steam locomotives were constructed at the Norfolk & Western Roanoke Shops. The era of streamlined steam ended on June 5, 1960 when Canadian Pacific Railway's 21 year old Royal Hudson, 2857, returned to Toronto from an excursion to Port McNicoll, Ontario. 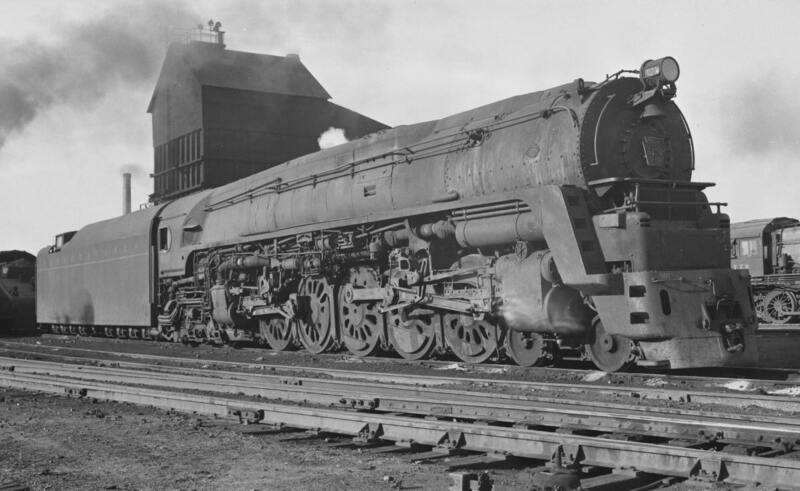 The New York Central's most well known locomotives were arguably their 275 Hudsons. They streamlined a number of these Hudsons using various designs. All designs were examples of some of the best streamlining found on North American railroads. On February 14, 1927, the New York Central presented the first of their fleet of 275 steam locomotives of the 4-6-4 wheel arrangement which they named the "Hudson" type. The design was influenced by the recent Lima "Superpower" 2-8-4 and NYC Pacifics. All but ten of them were built by ALCO (the others were built by Lima). These Hudsons were designed by NYC's former chief engineer of motive power, Paul W. Kiefer. The Hudsons were typically used to pull 16-18 car Pullman trains at speeds up to 94 MPH. All had boosters on the rear axle of the trailing truck which added roughly 10,000 lbs. starting TE. Unfortunately, none survived. The last one to be scrapped was number 5452. In 1934, J1E Hudson 5344 was the world's first streamlined locomotive. The "bathtub" shroud was designed by the Case School of Science of Cleveland, OH. In 1935 it was assigned to the 20th Century Limited which ran between Toledo and Chicago and remained in this service for some time. During July, 1939, this locomotive was re-shrouded to look like the 20th Century J3s. After an October, 1945 East Chicago grade crossing accident with a sand truck, the entire streamlining was removed. Another "claim to fame" of this locomotive is that it was the prototype for the Lionel O-gauge model. On December 7, 1941, two of the J3A Hudsons (5426 & 5429) were streamlined with a stainless steel cowling to match the Empire State Express train. This cowling was removed in 1949 & 1950. 5426 was also fitted with a centipede tender. In 1938, 10 of the J3 Hudsons (5445-5454) were built streamlined. The design was developed by Henry Dreyfuss. Half of these locomotives had boxpok drivers. The other half had Scullin double-disc drivers. These locomotives were used primarily for New York - Chicago service. Shrouding over the main air reservoirs was removed in 1941. All streamlining was removed from these locomotives in 1945. Of all U.S. railroads, the Pennsylvania ("The Standard Railroad of the United States") probably experimented the most with steam locomotive designs and streamlining. Many of these experiments involved duplex-drive technology. They also covered a number of the famous K-4 Pacifics with similar shrouding. In 1939 the PRR built their first duplex-drive locomotive with a wheel arrangement of 6-4-4-6. The shrouding was designed by Raymond Loewy. During the first two summers of its existence (1939-40), 6100 was displayed under steam at the New York Worlds Fair. Its drivers were supported by rollers which allowed the drivers to turn (under steam) so that the fair goers could watch. During this period, the tender was lettered "AMERICAN RAILROADS". If you look closely at the front of the locomotive, above the frame and below the smoke box shroud, you will see an air horn. While being an impressive puller (it could haul a 1200 ton train at 100 mph), the 6100 turned out to be too long for most of the PRR trackage and turntables. It ended up in service only between Chicago and Crestline, OH. Even so, the 6100 proved to be both a public relations success (the 6100 was featured in several calendars and very well publicized) as well as a great learning tool for the T-1s that would be designed later. 6100 was taken out of service in 1944 (after only four years of service) and scrapped in 1949. To really appreciate how long this locomotive was, you must first have a frame of reference. Consider the Big Boy. The Big Boy was generally considered to be the "largest" steam locomotive ever. It was over 132 feet long. Unlike the Big Boy, the S-1 was not an articulated locomotive, yet, it was a whopping 140 feet long! I don't know what its designers were thinking, but the length of this locomotive was partly to blame for its failure (or lack of success). Baldwin had been toying with the idea of a duplex-drive steam locomotive for some time. They were even considering building a demonstrator model. However, before they could, the PRR placed an order for two of them for delivery in 1942. These locomotive were built to lead the Fleet of Modernism -- The Broadway Limited, The General, The Admiral, The Manhattan Limited and the Pittsburgher. The locomotives were designed by Baldwin while the exterior was designed by Raymond Loewy. In 1942 the duplex-drive 6130 was built for fast freight service on the PRR. Notice the rear set of cylinders are facing backwards. The rear cylinders were also smaller than the front cylinders as they only had to power two axles instead of three. As it turned out, the rear set of cylinders caused problems. They were in a dirty location (next to the ash pan) and because of their location, they limited the size of the firebox. Wheel slip was also a problem with this locomotive. In 1944 the 6131 was built. A re-arrangement of the drivers and cylinders had solved the problems of the Q-1. In 1945, 25 more Q-2s were built (6175-6199). The Q-2s were the most powerful (horsepower) and strongest (tractive effort) of all non-articulated steam locomotives. They were the most successful of all duplex-drive locomotives. However, because of dieselization, most had a short life and were stored by 1949. The Q-2s represented the ultimate in steam freight development in America. In a way, they could be considered the 4-10-4s of America that were never built. Sadly, none were saved. In 1945-46, two groups of T-1s were built. 5500-24 were built by the PRR in Altoona in 1945. 5525-49 were built by Baldwin in 1946. The appearance of these T-1s differed from that of the first two (6110 and 6111). The first two T-1s had sharp noses. These were more rounded. They were all painted Brunswick green. However, it was often hard to tell. Surprisingly, the shrouding made them dirty locomotives (smoke stayed close to the locomotive). Most of the T-1s were retired by 1949. Sadly, all were scrapped by 1953. The PRR insisted on using poppet valves (instead of Walschaerts valve gear) on the T-1s. Maintenance on poppet valves turned out to be high. According to most books on the subject, the T-1s turned out to be slippery locomotives even at speed. Why wasn't this known after testing the 6110 and 6111? The 6110 and 6111 were tested under ideal adhesive conditions. The later batch of T-1s ran on a larger portion of the PRR system and under all conditions. Even though the factor of adhesion was designed to be greater than 4.0, the slipping problem was never solved. At least that is what "the books" claim. It should be noted that the retired enginemen who actually ran the T1s claim that they were not unduly slippery (even at speed), as most authors have claimed. Their secret to starting trains was to put down a little sand when stopping, a little when starting, and to use a light throttle up to 25 mph. Their secret to avoiding high-speed slipping was a longer cutoff coupled with partial throttle. The T-1s ran very well at speeds over 100 MPH. The Canadian National Railway created streamlined a version of their 4-8-4 "Confederation" wheel arrangment. In 1936 the Montreal Locomotive Works built 6400-6404 for the Canadian National Railway. In their streamlining design, the CNR did extensive research using wind tunnel tests to keep smoke from swirling around the locomotive cab. However, these locomotives were fitted with non-streamlined vanderbilt tenders. The CNR gave the name Confederation to this 4-8-4 wheel arrangement. The Grand Trunk Western used the same design for their class U-4-b (6405-6410). CNR 6400 was displayed at the New York World's Fair of 1939. It was also displayed at Railway Week in Belleville, ON in 1964 (2nd from the left). It is now on display at the National Museum of Science & Industry in Ottawa, Ontario. The CPR built two classes of 4-4-4 Jubilees. Strangely, the first class was called "F-2a" and the second class was called "F-1a". The first group, built in 1936 (3000-3004), had their main rods connected to the leading pair of drivers and were CPR's first streamlined steamers. The second group, built in 1937 (2910-2929), had their main rods connected to the trailing set of drivers. Two Jubilees from the second group survive today. 2928 is at the Canadian Railway Museum in Delson, Quebec. 2929 is at Steamtown in Scranton, PA. In 1937 30 streamlined Hudsons were built for the Canadian Pacific Railway. 10 more were built in 1938. The streamlining design of these locomotives was patterned after that of the Jubilee's. Four of these locomotives survive today with one more from an earlier non-streamlined class. The class H1b Hudsons were not streamlined. In July 1998 Canadian Pacific Railway announced publicly that is has acquired and is repatrioting for corporate heritage purposes ex-CPR H1b 4-6-4 #2816 from Steamtown, Scranton, Pa. Movement was scheduled for Sept 10, 1998 and was under the direction of BC Rail's Steam Shop Supervisor Al Broadfoot. (BC Rail once operated ex-CPR H1e Royal Hudson #2860 in tourist excursion service.) CPR moved 2816 to BCR's North Vancouver, British Columbia steam shop for restoration to operation. 2816 was found to be in basically sound condition and economically "restorable". 2839 has an abundant history. After serving on some of the last commuter trains in Montreal in 1960, it was put on display at the Ontario Science Center in Toronto. In 1969 it was sold to private owners and moved to Pennsylvania. Southern Railway briefly operated it in 1979-80. In 1980 it was stored at the Wilmington & Western in Greenbank, Delaware. It saw operation once on the Blue Mountain & Reading in 1984. Leased by the Lehigh Valley Scenic Railroad, it had been moved to Allentown, PA for restoration. They planned to run weekend excusions from Bethlehem to Steamtown with a stop in Jim Thorpe. Today 2839 is on static diaplay at the Nethercutt Museum in Sylmar, CA. In 1939 2850 piloted Their Majesties King George VI and Queen Elizabeth 3224 miles from Montreal to Vancouver without mechanical incident. Embossed crowns were later added to the skirts of all streamlined Hudsons by Royal permission. Because of this, all streamlined CPR Hudsons are called Royal Hudsons. 2850 was also displayed at the New York World's Fair of 1939. 2850 was rebuilt less than a year before being donated to the museum. This locomotive is currently kept under roof in good cosmetic condition. This locomotive is currently kept under roof and in good cosmetic condition. For many years 2860 had been in regular service but not in its proper CPR livery. In June, 1998, 2860 was taken out of service because of boiler problems. During the boiler work, more problems were found. Starting September 1998, CPR 3716 was being used in place of 2860. Today, 2860 is diaplayed (operational) in Squamish, BC. The Canadian Pacific Railway applied the name Selkirk (from the Selkirk Range of the Rockies) to the 2-10-4 wheel arrangement (instead of using the "Texas" name). The CPR Selkirks were unique for two reasons: first, they were streamlined (odd for a freight wheel arrangement), second, they were built for passenger service. 5931 is on display at the Heritage Park Historical Village in Calgary, Alberta. 5935, (also class T1c) is on display at the Canadian Railway Museum in Delson, Quebec. In 1946 the C&O converted four 25 year old F-19 Pacifics into class L-1 Hudsons (490-493). They had stainless steel and orange shrouds. 490 was the only one to see service after 1950. Its orange cowl was repainted yellow. C&O crews called these locomotives Yellowbellies. 490 is now on display at the B&O Railroad Museum in Baltimore, MD. In 1937, West Burlington installed a stainless steel shroud and roller bearings on CB&Q 3002 in order to use it as substitute power on the Zephyrs. It was renumbered 4000 and named Aeolus (Greek God of the Winds). Crews were quick to refer to this locomotive as "Big Alice the Goon", after a character in the Popeye comic strip. 4000 saw regular duty heading the Chicago to Denver Aristocrat and Exposition Flyer. In 1941 West Burlington built a similarly shrouded Hudson 4001 also named Aeolus. 4000's shrouding was removed in 1941 but the nickname stuck. 4000 is now on display in a park in LaCrosse, WI without its shrouding. In 1941, the Chicago and North Western Railway had two of their class ES (superheaded) Pacifics fitted with streamlined shrouds. They were streamlined to pull the "400" express passenger trains between Chicago and Minneapolis. However, the C&NW decided to use diesels instead. The two streamliners were demoted to pull the Minnesota 400 and then local passenger service. Four modern atlantic type locomotives were purchased in 1935 to power a high speed train named the "Hiawatha" between Chicago and St. Paul/Minneapolis. These were the first steam locomotives to be built streamlined. They were also the first steam locomotives intended to cruise at 100 mph (they could reach 120 mph). Average speeds of these trains were 60 mph with top speeds of about 100 mph. They regularly pulled nine car trains. The impressive capabilities of these locomotives were mainly due to the large steaming capacity (large firebox) and their large 84 inch drivers. The four locomotives were numbered simply one through four. Pictured is number three. They were extremely successful. Number 3 was retired in 1949. The other three retied in 1951. Unfortunately, all were later scrapped. Six Otto Kuhler-styled Class F7 hudsons numbered 100-105 were delivered to the Milwaukee Road in 1938. The original A's and older consists were released for service on other sections. The F7s were assigned routes between Chicago and Minneapolis. They were scheduled to cover a portion of this route at 81 mph -- the world's fastest regularly scheduled steam-powered train. They often exceeded 100 mph on this route. All six of these locomotives were scrapped between 1949 and 1951. 988 was streamlined after being converted from a Camelback. The streamlining was done at the Lackawanna Scranton shops. It was the only streamlined 4-4-0 locomotive. This has to be the ugliest steamlined steam locomotive I have ever seen. This class was built in 1905. 1011 was streamlined in a way similar to 988. Norfolk & Western class J locomotives were built in the N&W Roanoke shops. They were numbered 600 - 613. The Js were designed to replace the 4-8-2s hauling heavyweight passenger trains over the rugged routes through the Appalachian Mountains. However, wartime restrictions on materials required that locomotives 605 - 610 be classified as freight locomotives and built without shrouds (they were later shrouded, after V-J Day). They regularly travelled at 90 MPH and the Norfolk & Western placed no limit on their speed in otherwise unrestricted territory. They were America's last 4-8-4s. They could generate the highest tractive effort of any 4-8-4. They were the last 4-8-4 streamlined steamers. 602 was unique in that it was fitted with a Franklin high speed trailing truck booster which added 12,500 lbs. TE. After many years in excursion service, 611 survives today at the Virginia Museum of Transportation in Roanoke, VA.
New York, New Haven & Hartford had 10 very successful streamlined, class I-5 4-6-4 Hudsons. They were built streamlined by Baldwin n 1937. They were called Shoreliners on the NYN&HRR and were used to pull the premiere Yankee Clipper and Merchant's Limited between New York and Boston during the period between 1938 and 1950. They pulled these trains even after the DL-109 diesels became New Haven's standard because the diesels could not keep the four hour schedule. The white wheels were very noticeable but turned out to be impractical. Even after the ALCO PAs came on board, the I-5s were kept in reserve for a couple of years. When you hear the phrase "Southern Pacific Daylight" you think of Southern Pacific 4-8-4 number 4449 and others of that class. However, the Southern Pacific decorated a number of other locomotives in this same red, orange and black "Daylight" livery. In 1927 and 1928 the Sacramento and the Los Angeles Shops each rebuilt two A-3 locomotives into A-6 locomotives. Two of these were later painted in the red and orange daylight paint scheme and assigned to the Sacramento Daylight, a Sacramento-Lathrop section of the San Joaquin Daylight. By 1952 all four were scrapped. Three of the class P-10 Pacifics were streamlined with skyline casings and side skirts in 1941. #2484-2486 were used to haul the San Joaquin Daylight between Oakland and Bakersfield". Connelly's Baldwin list shows 5 road numbers that were altered (2481-2482, 2488-2489, 2491). Three ex SP P-6s (650-652) were rebuilt and streamlined in 1937 for the Sunbeam and the Hustler. In the late 1940s five of the SP Mountains were repainted in a "Daylight" paint scheme for use on train numbers 51 and 52 of the San Joaquin Daylight. Golden State Class Northerns were delivered to the Southern Pacific in several classes. The first batch, class GS-1 (4400-4409) from Baldwin were not streamlined. The second batch, class GS-2 (4410-4415) from Lima were. The third batch, class GS-3 (4416-4429) had 80" (instead of 72") drivers. The fourth batch, class GS-4 (4430-4459) had a mars light and an all-weather cab. The fifth batch, class GS-5 (4458-4459) were two GS-4s fitted with roller bearings. The sixth batch, class GS-6 (4460-4469) were classified as freight locomotives and painted black because of the war. It was for this same reason that "GS" was changed to stand for "General Service" instead of "Golden State". In my opinion, with their skyline casings, running board skirting, and red, orange, and black colors, the Golden State Class Northerns were the best looking streamlined steam locomotives ever. GS-4 4449 survives in Portland, Oregon and is operational. War baby 4460 is on display at the Museum of Transportation in St. Louis, MO. Union Pacific's Omaha Shops shrouded two locomotives in 1937. The 2906 was one of 10 P-13 Pacifics built for the UP by Baldwin in 1920. The 7002 locomotive was built to pull heavy passenger trains over the Rocky Mountains, with massive 6-foot wheels driven by 4,000 horsepower. They were shrouded primarily to serve as relief power for the dieselized Cities streamliners between Omaha and Ogden or Denver. Pacific 2906 and Mountain 7002 served between 1939 and 1941 on the Forty-Niner, a heavyweight, all-Pullman streamliner departing five times a month from Chicago to San Francisco, site of the Golden Gate Exposition. The locos bore UP's prewar streamliner colors of Armour Yellow, Leaf Brown, and Scarlet. The 7002 ended its spectacular 32-year career as a rescure engine for stalled locomotives.